DANVILLE, Va. - The Appalachian League announced its All-Star team on Thursday, and Danville Braves pitcher Dilmer Mejia earned two prestigious honors. 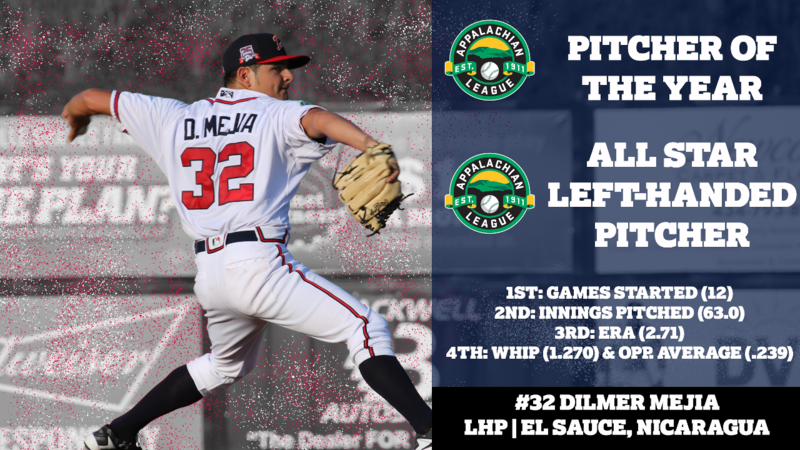 Mejia was selected as the Appalachian League's Pitcher of the Year and as the left-handed selection for the league's All-Star team. The southpaw out of El Sauce, Nicaragua, went 5-3 in 12 starts with Danville so far this season. In 63 innings of work, Mejia has held a 2.71 ERA with 51 strikeouts and a 1.270 WHIP. The fifth-year professional had a 3-1 mark in the month of July, posting a 2.28 ERA in five starts across 27.2 innings pitched. Mejia leads the league in games started (12), second in innings pitched (63.0), third in fewest baserunners per nine innings (11.86) and ERA (2.71) and fourth in WHIP (1.270) and opponents average (.239). Joining Mejia are players and a manager collectively from the Princeton Rays, Bluefield Blue Jays, Bristol Pirates, Kingsport Mets, Elizabethton Twins and Johnson City Cardinals. The D-Braves will finish its home schedule with a Thirsty Thursday at Legion Field tonight at 7 p.m.